Lopez Island’s only goat dairy, Sunnyfield Farm, needs an aging room to bring more farmstead cheese varieties to your table. Please join other Lopezian’s donating to help Sunnyfield Farm grow! Soon after becoming a part-time Lopez resident, Claver became familiar with the growing – yet economically challenging – farming movement on the island. He was also aware of the impact that the 2010 Food Modernization Act (FMA) would have on food producers with limited resources. The FMA was going to require a lot more stringent and regular verification of food production, storage and distribution methods – protecting consumers against harmful allergens and bacteria such as salmonella and listeria, which causes the death of three pregnant women every day. Until now, if farmers wanted to verify the safety of their food, they’d have to send samples off-island, usually to labs in Seattle – a costly, inefficient and often ineffective way of doing so. “I wouldn’t dream of sending Lopez food samples to Seattle to be tested,” said Claver, as he described all the ways food can be contaminated after it leaves its clean, safe place of origin – the same things that can happen to food that’s imported to Lopez from off-island. Locavores make soup for Lopez Fresh! The Lopez Locavores love to feed our community fresh, organic, local food! Today they were at it again cooking soup with ingredients from local farms and gardens for the Lopez Island Family Resource Center food bank. Yummy winter soup for the new freezer at Lopez Fresh donated by the Locavores. Bruce Botts graciously hosted todays cooking party at Vita’s commercial kitchen. Locavore members Christine Langley, Marney Reynolds, Nancy Wallace, Michele Heller and Sue Roundy made two soups: Vegetarian Squash Apple Bean and Squash Apple Bean with Ham. Donating the organic soup ingredients were Bounty farmers Ken Akopiantz of Horse Drawn Farm and Christine of Lopez Harvest, and Lacavore members Marney, Michele and Sue. The only non-Lopez ingredients were salt, pepper and olive oil! Marney and Christine are always happy to cook for our community! 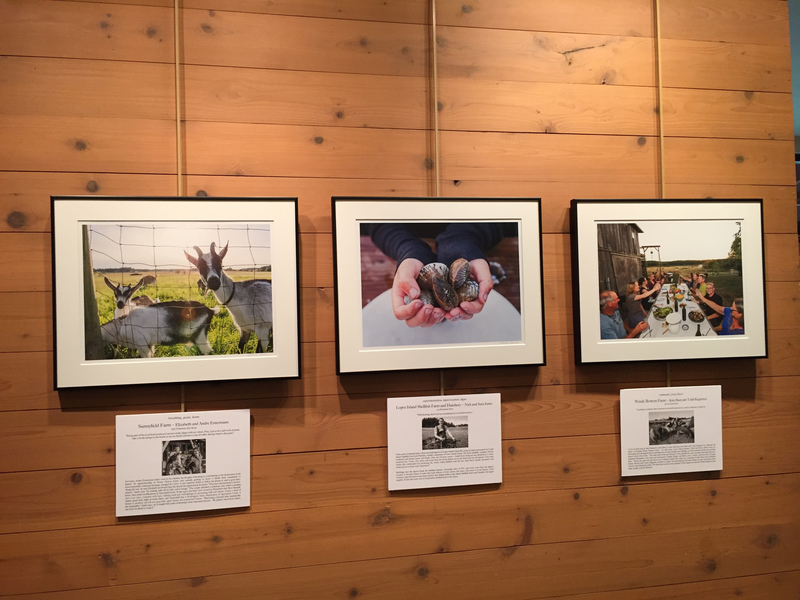 “Know Your Farmer” Photo Exhibit closing Friday! The exhibit opening October 23 was a smashing success! Bounty farmers and friends gathered at Lopez Center to view 28 beautiful photos by Steve, Summer and Robert and read farmer profiles by Iris. If you missed the opening you have two days to view all 28 photos and farmer profiles together. One half of the exhibit will be shown at the Lopez Library from December 18 to January 29 and the other half from July 15 to August 26. We are on the lookout for other venues large enough for the entire exhibit! “There’s a lot of agriculture, both large- and small-scale, happening on Lopez that so many people don’t know about,” says Ken Akopiantz of Horse Drawn Farm. You can take one of these stunning photographs home with a $300 donation to the BOUNTY Book project! The book will be released next October. 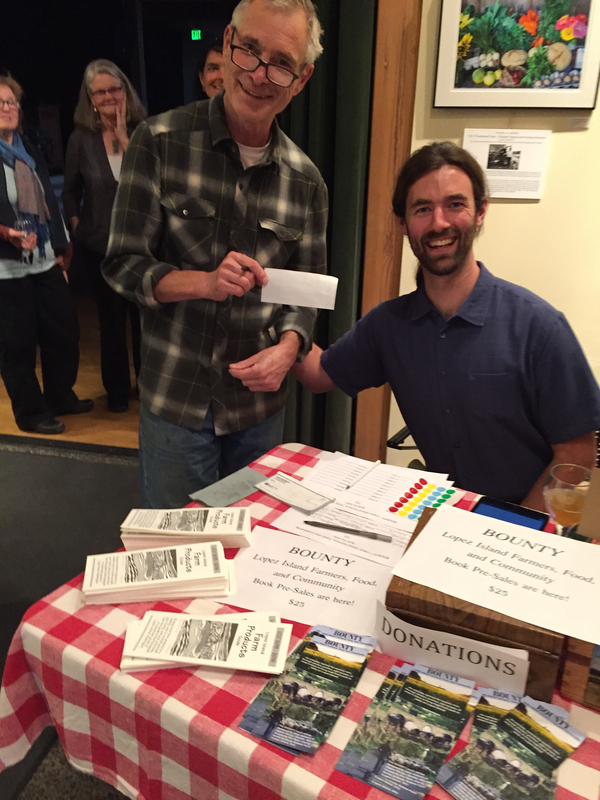 David Williams chose the Helen’s Farm photograph for his donation. 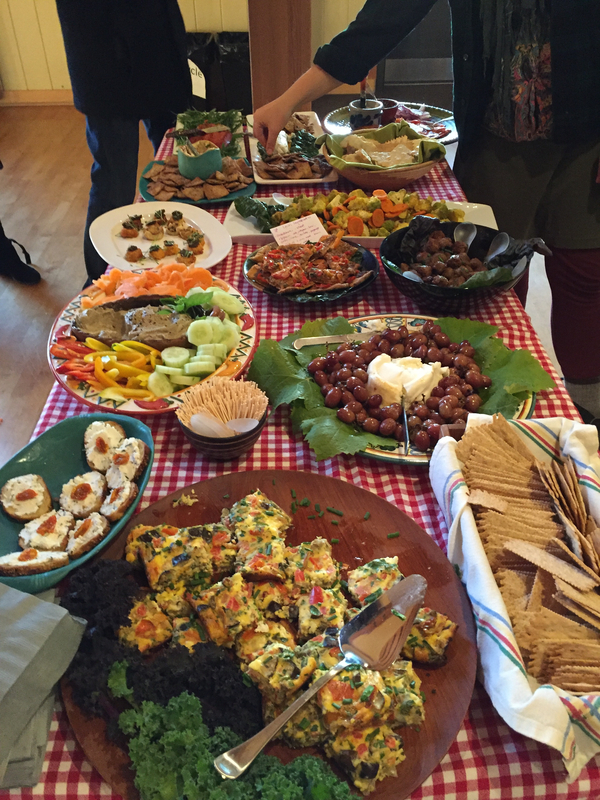 The opening celebration featured locally sourced appetizers and Lopez cider – of course! Three BOUNTY farmers are still showing up on Saturday from 10 – 2 at the market! For the last two Saturdays Adam from S&S Homestead, Julie from Helen’s Farm, and Andre from Sunnyfield Farm have been there. Next weekend may be their last so don’t miss this opportunity to buy fresh, organic vegetables, meat, and goat cheese all in one place!